Active Driver Plus are inverters used for the control of hydraulic pumps. Their obvious fields of application are domestic, industrial, and agricultural constant pressure pumping systems. The OLED display offers an extremely simple and intuitive graphic interface. Displaying or changing any parameters is extremely simple, which in turn also simplifies maintenance. Installation is also very easy: the installation wizard asks the user for the parameters required for the configuration. Active Driver Plus inverters provide a reduction of electric consumption, thanks to the inverter technology, whilst at the same time ensuring maximum comfort thanks to the constant pressure. 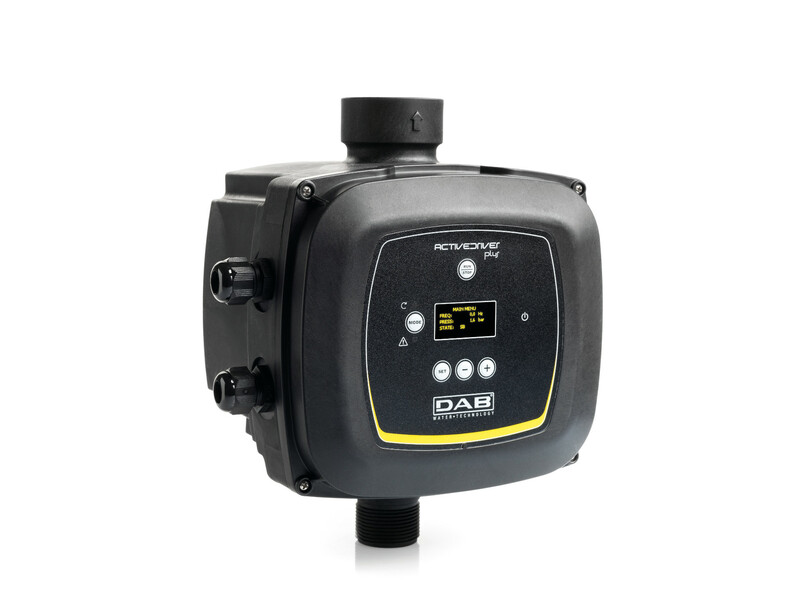 They are extremely versatile, as they do not require external sensors and non-return valves. There is in-fact a built-in pressure sensor, a flow switch, and a non-return valve. - energy savings, thanks to the inverter technology. - all the built-in protections: dry run, overload, abnormal voltage, overtemperature, freezing. Line voltage: 115V and 230V single-phase. Power supply frequency: 50 Hz - 60 Hz. Maximum working pressure: 13 bar. Pressure regulation range: from 1 to 13 bar. Suction diameter (DNA): 1 1/4” male. Delivery diameter (DNM): 1 1/2” female.